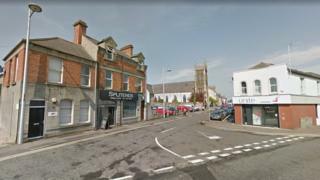 An elderly woman has been hit with a crowbar during a robbery at a church in Portadown, County Armagh. The pensioner, who is in her 70s, had gone into a church on William St on Friday and disturbed a man as he was trying to prise open a donation box. He left the church when he saw her, but returned and demanded money from her. "At first, the lady refused to hand over her purse but when this man hit her with the crowbar, she did give him a sum of money," police said. Det Sgt Stephen Wilson said the pensioner was "left shaken and has some bruising to her left shoulder". Officers investigating the robbery have arrested a 45-year-old man. He was detained on suspicion of attempted theft and robbery; going equipped for theft; and possession of an offensive weapon with intent.